Have you checked in periodically to see how the project was going and been assured it was under control, then bitten your tongue as you watched your child embark on said project at 9 p.m. the night before it was due? Choosing to send your child to private school can be a daunting decision. Here, education experts offer advice on what to consider before making the leap. Read Ann’s contribution to learn fun and easy strategies to help your elementary schooler soar this school year. Any parent familiar with nightly homework knows that where homework gets done can become just a much of an issue as when it gets done. The best place for homework depends on the child. Listen to Ann’s interview with WTOP on setting up a study space, and other tips to ease homework hassles. At the beginning of the school year, every student starts off organized. They have brand-new folders, a tidy binder and a clean backpack. But, for many, maintaining neatness can be a real struggle. Listen to Ann’s interview with WTOP to find out how parents can help their kids get and stay organized. In June, the whole family is excited: Your kids are “free at last” and you’ve earned a break from the before- and after-school routine. The problem is August is coming to an end, and if you’re not careful, the beginning of school hits the whole family like a ton of bricks. Listen to Ann’s interview with WTOP to find out how you and your children can ease back in to school in a painless way. Studies show that kids can lose ground over the summer if they don’t engage in any learning. How can parents find the balance between nothing at all and going overboard? Do you wonder if homework is really all that beneficial for your kids? And if so how much they should be getting? Listen to Ann Dolin’s latest WTOP segment to find out! When the end of the quarter is winding down, kids need to start preparing for those big unit tests. But how should they go about studying for them without getting stressed out? Listen to Ann Dolin’s latest WTOP segment for some recommendations. It’s a new year… and the perfect time to get re-organized and ready for the second half of the school year! In Ann’s latest WTOP interview, she covers 3 tips to help your kids get organized and ready for school in the new year. For most parents in the area, November is the month for parent-teacher conferences. But a lot of times it’s hard to know how to make the most of them so that you can actually help your child improve. In Ann’s latest WTOP interview, she covers How to get the most from a parent-teacher conference and provides recommendations on what to come prepared to talk about. October is ADHD awareness month, and the perfect time to learn a little more about the disorder if you’re not completely up to date. In this interview Ann provides her perspective on the topic, along with a few tips for parents on improving focus and eliminating distractions with ADHD. Back to school is an ideal time to get organized to start the new year strong. In this interview Ann share practical tools and strategies parents can use with their kids to make this school year the best one yet. Ann Dolin weighs in on what to include, what to leave out and how it can make a world of difference for an easily distracted student. Ann discusses how you can use toys like glow-in-the-dark stars to pique younger kid’s curiosity for learning. Ann talks summer learning with Fox 5 DC, including how to keep kids “school ready” over the summer so that they don’t lose progress. It can be hard for children to go back to school from summer vacation and forget some of the material they learned in school. Ann Dolin, President of Educational Connections Tutoring joined us to tell us about the importance of making sure your kids learn during the summer break. With getting into college more competitive than ever, high school students are putting a lot of effort into preparing for college entrance exams — namely the SAT and ACT. In some selective schools, these scores account for fifty percent of the admissions decision. So what can students expect these days? WTOP’s Shawn and Hillary spoke with Ann Dolin who shares the latest on what kids and their parents need to know. When your kid gets a “A” in class — it’s not that special anymore. In fact it’s a lot more common than it used to be. And that’s not because the kids are better students. It’s because the teachers are less discerning. WTOP’s Shawn and Hillary spoke with Ann Dolin, President of Educational Connections Tutoring, about the problem with grade inflation. What’s the role of homework, and is it even valuable in the first place? Ann Dolin joins Steve Bridgewater on her CBS DC Public Affairs show, The Washington Report. The American Academy of Pediatrics recently released guidelines about how technology affects children, especially during their prime developmental years. They recommend that children from 2-5 years should be spending at maximum one hour on electronics per day. Parents also need to monitor what their children are viewing while they’re online. In a world where technology and electronics are everywhere, how do we help monitor our child’s screen time without causing arguments with them? Here to talk about technology distractions is Ann Dolin, President and Founder of Educational Connections Tutoring in Fairfax, Virginia. For many parents and students, homework can be anxiety inducing, especially when there’s a lot of it, when it’s intense, when there’s pressure to succeed and when it’s used as a measure of accomplishment. The “no homework” movement is catching on nationwide, even here in DC where a school in Arlington is testing the idea that homework isn’t necessary. Joining us today was Ann Dolin, President of Educational Connections Tutoring, and author of the book Homework Made Simple: Tips, Tools and Solutions for Stress-Free Homework. Replay this free expert webinar with Ann Dolin, M.Ed., and download the expert slides. Motivation to stay focused on homework is the most important key to success for students. According to Ann Dolin, president and founder of Educational Connections Inc., as your child gets older and accumulates more homework, the amount of time should generally increase by 10 minutes per grade level. However, due to a variety of distractions as well as the difficulty of Honors and AP classes, it can take high schoolers at least three hours to do their homework. As a result, they have less and less time for diversions. Ann Dolin shares tips for helping children get organized for school! This Monday, it’s back to school for several children in the D.C. region, following last weekend’s blizzard and residual cleanup. Of course, it could be tough for local students to get back into a rhythm after such a long break. Thankfully, there are some things students and parents can do this weekend to ease the transition. “Carve out some time over the next few days and really turn those electronics off,” says Ann Dolin, president of Educational Connections Tutoring. Ann is featured in the Washington Post Magazine. Ann Dolin shares the tips that will help your kids and grandkids ace the rest of the school year! Ann Dolin lends her advice in the August 17, 2015 issue of Women’s World. It is important for students to stay engaged with learning over the summer to continue their progress with school. In fact, students can lose up to 15% of their academic ability if they don’t practice reading and writing over the summer. Many parents and kids alike, enjoy having a break over the summer to recharge their batteries. But, studies show that it isn’t always such a good idea. In fact, students can lose up to 15% of their academic ability over the summer if they don’t read, write and practice math. Ann Dolin, president of Educational Connections Tutoring, has tips on how parents can avoid the summer learning slide. Ann’s advice appears in The Huffington Post. Ann Dolin lends her advice in the September 1, 2014 issue of Women’s World. Ann discusses what parents can do to help their child get and stay organized this school year. School is almost out, and students around the country are looking forward to three long months of summer vacation! But with all the relaxing, kids can lose a lot of academic progress. Ann visited Let’s Talk Live to explain how parents can help their kids avoid the summer learning slide. Ann discusses the findings of a new study from the American Psychological Association regarding girls versus boys in the classroom. Ann discusses the announcement from the College Board regarding the upcoming changes to the SAT. Ann Dolin shares her thoughts on a new study in the Journal of Experimental Education that points to a positive correlation between excessive amounts of homework in high school and physical ailments. Ann presents research-based study techniques to help kids with attention deficit learn faster, retain more, and perform better on tests. An interview with Ann about her journey and her thoughts on the future of education. Processing, learning, and remembering information…it can be hard for those with ADHD. Isn’t hard overrated? Why not take the path of least resistance? In this episode of ATR, Ann Dolin shares how to figure out how you naturally learn. Ann discusses the important trends in education for 2014. Having been on both sides of the parent-teacher conference, Ann Dolin gives advice on how parents can make the most of their short time with their student’s teachers. Ann contributes to a Connections Newspaper piece on selecting the right independent school for your child. Ann Dolin — a consultant, author, public speaker, and CEO and founder of Educational Connections, an in-home tutoring group in Northern Virginia — has a few tips for families getting ready to go through the application process. Ann Dolin lends her advice in the September 2, 2013 issue of Women’s World. Dolin illuminates the ways that boys learn differently from girls. 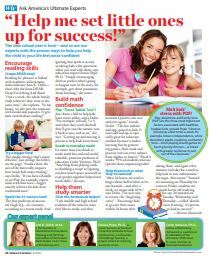 Q&A with Ann Dolin: Author & “Accidental Entrepreneur” of Educational Connections, Inc.
Ann Dolin is featured in the September 10, 2012 issue of Women’s World. Tommy Tucker talks to Ann Dolin, author of Homework Made Simple: Tips, Tools, and Solutions For Stress-Free Homework, about how too much homework is actually hurting students. Ann is consulted for the NBC News publication. ADHD and Homework Struggles: A Chat with Ann Dolin, M.Ed. Ask the Expert: Ann answers questions in the April 2012 issue of CHADD’s Attention Magazine. On June 23, 2011, Ann was interviewed on the program Let’s Talk Live. She describes ways to keep children learning and active over the summer. Ann discusses tutoring, homework, and the roles that parents play on the Parents’ Perspective radio show with hosts Linda Perlis and Sandra Burt. On September 8, 2010, Ann was interviewed about her new book on The Morning Drive on AM800 CKLW.